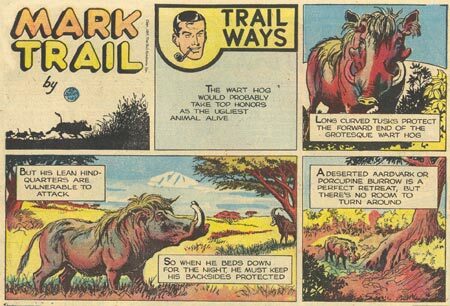 This entry was posted on Sunday, March 24th, 2019 at 11:02 am	and tagged with bolas spider, Flash Gordon, four-eyed fish, God's stuff, mandrake the magician, mark trail, my childhood, nostalgia, prince valiant, Sunday color comics, wart hog and posted in Just for Fun, memory lane, nature, Pop Culture. You can follow any responses to this entry through the RSS 2.0 feed. To me, that’s the point; the abundance present in all of God’s creation. I have a friend in California that knows I do not take the newspaper in my town or in my state, so he sends me the Sunday comics that he cuts out. I take a package of them with me when I am substitute teaching in case things get slow (like when all the class does is machine learning). I have to be careful not to laugh out loud when I come across a really funny one. Are any of the old classics still around? Blondie and Peanuts are still going strong. And I think I saw a Beetle Bailey. The LA Times recently censored Non-Sequester recently because they said something that went against PC. According to Aristotle, the essence of comedy was to produce the unexpected, usually by turning the tables on the rich, the powerful, the proud, etc–for instance, the big-shot banker taking a prat fall. I think he would see PC and comedy as polar opposites. Which explains why leftids have no sense of humor.